Before and after every meet, the Ohio State synchronized swimming team gathers in a circle outside the pool, always leaving one spot open. The history of Ohio State is full of various traditions and rituals among current athletes on teams at the university and former student athletes. For “The Circle,” coaches, swimmers and even alumni meet next to the pool, unless the meet is at home. At their home pool, the swimmers stand between the dive well and the pool. 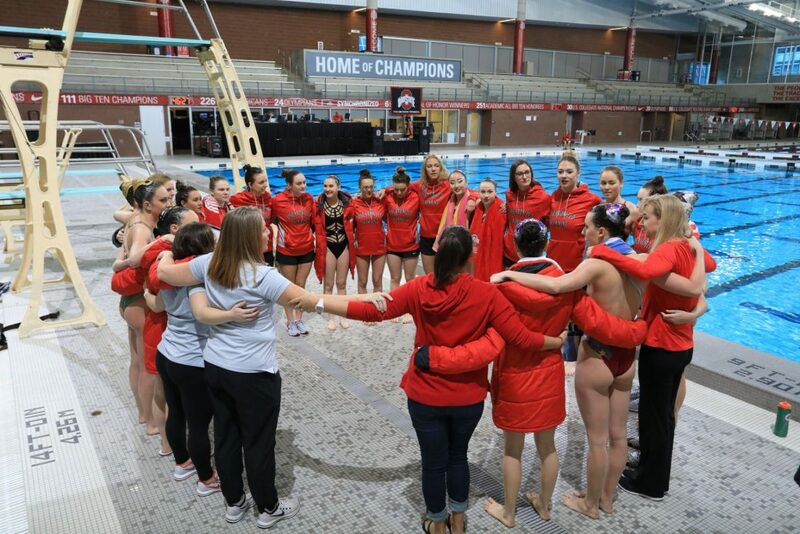 Before each meet, while in the circle, they sing a song called “Long Time Sun” and after the meet concludes, they gather again to sing “Carmen Ohio,” an Ohio State tradition after many sporting events. Head coach Holly Vargo-Brown, an Ohio State synchronized swimmer from 1986 to 1990, remembered being a part of some of the original circles, but couldn’t pinpoint exactly when the ritual began. Vargo-Brown said “The Circle” unites the past and the present and provides a space for everyone to take a second to breathe. She also stressed the importance of current swimmers connecting with alumni so they might understand how fast time as a member of the team passes. Once a year, though, that circle is closed. Instead of excitement and joy, tears are shed for a cherished former Buckeye. On Feb. 10, the team traveled to Beck’s hometown of Richmond, Virginia, for an annual meet. Each year while in Richmond, the team circles around Beck’s headstone with tears shed for the teammate many on the team never had a chance to meet.